The Spirit of 3 Loves v Zombieland. How you sense a Continuous Improvement Culture. Warning. I’m going to talk about Love in a minute, nervous types can look away now. What does an organisation that is founded on ‘The Spirit of Three Loves’ look and feel like? How does love make any difference in a culture of continuous improvement? Surely it’s all about; logic, process, systems, targets and driving efficiencies, isn’t it? Well I don’t think that’s necessarily so….. this is why. Last week I had a visit to one of my favourite manufacturing sites, Ricoh in Telford, as part of an Ideas UK Networking Meeting. The official purpose was to learn about continuous improvement and employee engagement. My objective was to learn about love. The success of Ricoh is self-evident. Just go to reception and look at the cabinets full of awards recognising what they do. When you go beyond the ‘shop window’ however, you start to see some of the things that contribute to the success, including love. A while ago I learned about the Ricoh Spirit of Three Loves and wanted to see what it meant it for myself. I found it, prominently displayed in a meeting room. 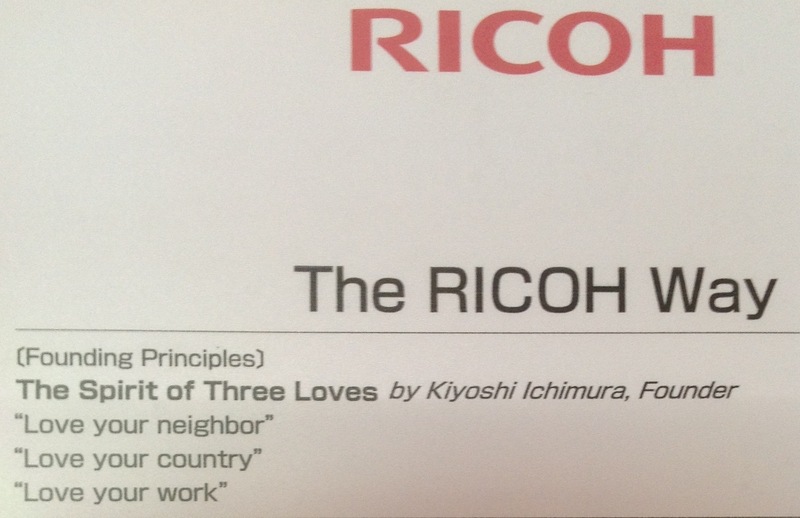 The 3 Loves are the founding principles of Ricoh which were created by Kiyoshi Ichimura back in 1946. People look you in the eye. When you meet people or walk around the factory people will ‘eyeball’ you. Not in a suspicious ‘what are you up to’ way, but more with a ‘twinkle’ that is about enquiry and saying, ‘hello, you are someone different, can I help you’? Perhaps this has something to do with ‘Love your neighbour’? They constantly look at ways to improve. The whole point of the visit was to learn about continuous improvement. Examples of activity to understand the work and improve it were everywhere, including my favourite, Gemba Mat. On a previous visit I remember watching people at work. Team members would take the initiative, step in to help others, go beyond what was ‘required’ of the job. People do seem to ‘Love their work’. Recognition is everywhere. 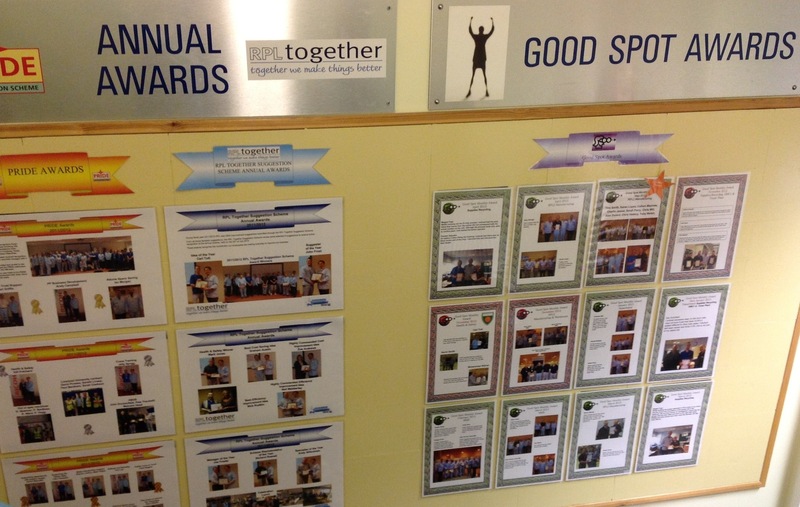 From the Kaizen Forest, to the Monthly Team Awards, to the Hall of Fame, to the Trophies in Reception and the ceremonial spades, everything good is recognised. I spotted awards going as far back as 2002 in the Hall of Fame. This wasn’t because they couldn’t be bothered to take them down, it was deliberate. A bit like the prize winners board at a school, or captains’ list in a sports club it gives a sense of achievement and longevity. That sense of longevity, ‘we are doing this for the long term’ may well a consequence of the founding principles of love. This ‘Spirit of the Three Loves’ approach is quite different to what I see on many of my travels. Dan Slee recently wrote this post about about what torn carpets and poorly maintained shops tell you about a high street retailer. You can sense a lot from the physical environment and the people you bump into at an organisation. Do the people love what they do? Do they love you as a customer or service user? I have heard people say how much they hate their jobs or organisation. If that view really is true, I do wonder about the quality of what they produce. Zombie staff. People with no spark of life, shuffling around corridors aimlessly, never making eye contact and wishing for the end of the flexi-time period to go home. A final thought. I saw Robert Holden speak at Academi Wales Summer School recently about the importance of love. He was great to listen to, but I couldn’t quite visualise what it looked like in the workplace. I think the visit to Ricoh has helped with that. A continuous improvement culture is about more than just logic and processes. How people feel about each other, their work and the organisation play a big part in any culture. Talking about principles, values and culture in terms of love (something most people seem to recognise), might be a good thing. 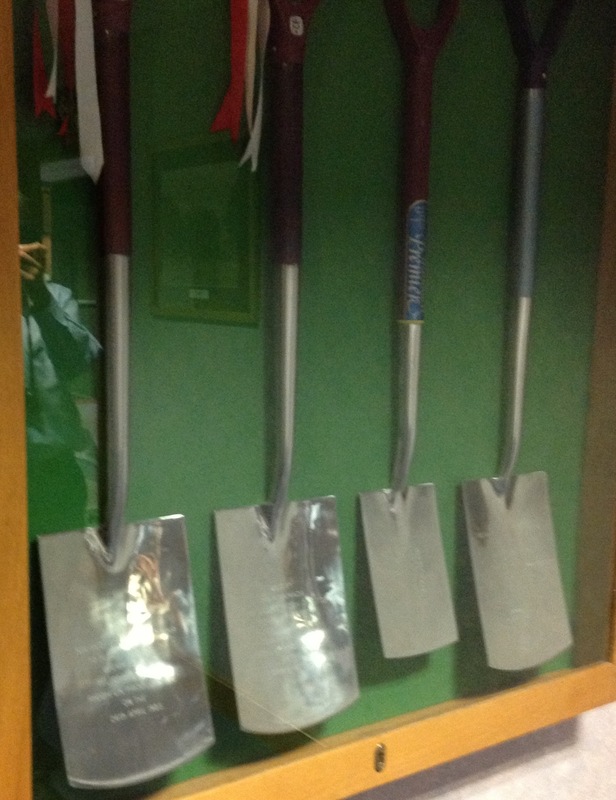 Just a small part of the Ricoh Hall of Fame, and some ceremonial spades. Good things are recognised. I think the environment , leadership, management and culture of a few organisations does a lot to turn good people into Zombies. Shocking when you think that the opposite effect is also possible. Thank’s for reading and commenting. The spades were brill! You’re right about them emphasising the achievements – I remember taking one picture from the building which included from 2003. As a staff member who may have been rewarded that year, it would feel great to know that my organisation still valued my achievement from a decade ago. Great post! It reminded me of the school honours board. The history of achievements acting as inspiration for the future. Organisations are ultimately just a construct to hold people together. It’s worth recognising what they do. ← Six email Hand Grenades to avoid before the holidays.